Request a quote for a bulk order for 1-methyladenosine monoclonal antibody. Please fill out the form here below. Your local sales account manager will get in touch with you shortly and send you a quotation based on your requirements. 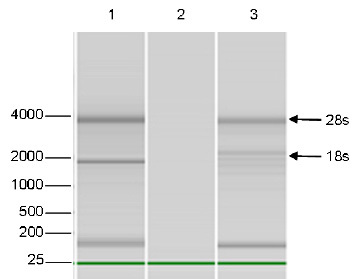 Monoclonal antibody raised in mouse against 1-methyladenosine (m1A) conjugated to KLH. Immunoprecipitation was performed on 40 µg total RNA isolated from HEK293 cells using 15 µg of the Diagenode monoclonal antibody against m1A (cat. No. C15200235) or with an equal amount of mouse IgG2b, used as a negative control. The immunoprecipitated RNA was subsequently analysed on a Bioanalyzer. Figure 1 shows the Bioanalyzer profile obtained with the negative control (upper left) and the m1A antibody (upper right). The lower figure shows the gel image for the input, the negative IgG2b control and the m1A antibody (lane 1, 2 and 3 respectively). The marker (in bp) is shown on the left, the position of the 28s and 18s ribosomal RNA is indicated on the right. HeLa cells were stained with the Diagenode monoclonal antibody against m1A (cat. No. C15200235). Cells were fixed with 4% formaldehyde for 20 min at RT, permeabilized with 0.5% Triton X-100 for 5 min at RT and blocked with PBS containing 1% BSA. The cells were immunofluorescently labeled with the m1A antibody (left) diluted 1:1,000 in blocking solution followed by a goat anti-mouse antibody conjugated to Alexa488. The middle panel shows staining of the nuclei with Hoechst33342. A merge of the two stainings is shown on the right. 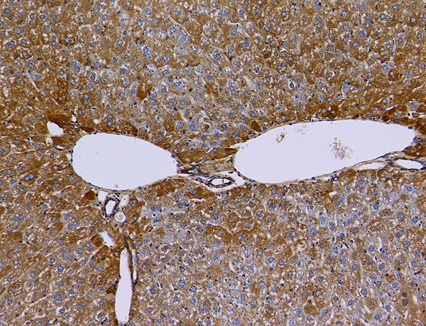 Paraffin-embedded mouse liver tissue was analysed by immunohistochemical analysis using the Diagenode monoclonal antibody against m1A (cat. No. C15200235) diluted 1:10,000 (brown). The slides were counterstained with Hematoxylin (blue). Diagenode strongly recommends using this:	1-methyladenosine monoclonal antibody (Diagenode Cat# C15200235 Lot# 004). Click here to copy to clipboard.